“I can not tell you what a world of difference this workshop has made for me as a teacher. I learned so much from both Carol and Kimberly but also from all the compassionate medical doctors that presented to us. I already knew I loved my seniors but I came back with a real passion for providing them with a safe and yet challenging class. “I am a nurse practitioner at the VAMC in Northport, New York and have been teaching the yoga component of a Mindfulness Based Stress Management 12 week program. 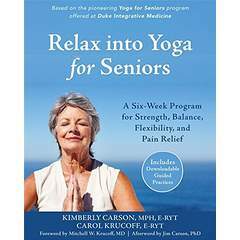 The veteran population has many physical and mental disabilities and diagnoses, so I have been looking for ways to offer the yoga experience to this elderly group. This highly professional training was spot on. It gave me a lens and a filter to work deeply with this population. Right from the start, we learned about the processes of aging and were able to physically experience it to deepen our awareness in an experiential as well as a didactic way. The knowledge was taught in a clear, in depth and scientific manner. The experiential component integrated safety and methods for modifications of yoga postures. Not only addressing the physical and emotional aspects of aging, the workshop also expertly incorporated spirituality through the guided exploration of the basic truth of impermanence.